Crude prices found some support yesterday, and today are trading at $47.71. Crude prices fell yesterday morning but managed to recoup their losses, ending the day a mere 5 cents above their opening price. Prices have risen $.16 (.34%) this morning. Volume picked up yesterday following the API report, but a high dollar managed to put a lid on any upward price movements. Refined products behaved similarly, falling yesterday morning before rising again midway through the day. 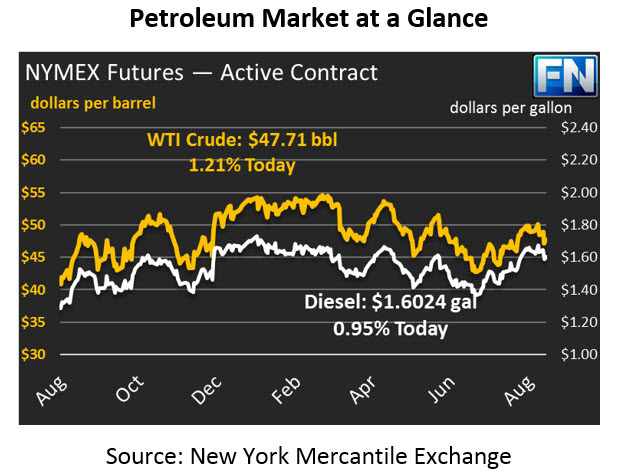 Gasoline prices gained a meager 11 points yesterday, closing the trading session at $1.5795. Prices this morning are $1.5854, 59 points (.37%) higher than their close yesterday and leading the gains for the oil complex. Diesel has struggled to keep up – diesel prices lost a light 9 points yesterday, and today have only gained 28 points (.18%) to reach $1.6024. Prices reversed their losses yesterday after the API reported a large crude draw, this time a whopping 9.2 MMbbl crude draw. Markets were expecting a 3.6 MMbbl draw, so the news should have helped boost prices. The API also reported a .3 MMbbl gasoline stock build, compared to an expected 1.5 MMbbl stock draw. Diesel inventories fell by 2.1 MMbbls. Of course, the API has had trouble with accuracy in recent weeks, so we’ll have to wait for the EIA to submit final numbers today. Prices have remained low amid slowing Chinese oil demand. News came out recently that oil imports have fallen to 7-month lows, and was followed this week by reports from Bloomberg that refining has fallen to 3-year lows for the month of July. As we’ve noted before, a reduction in demand means less call to pull fuel out of inventories, delaying OPEC’s goal of cutting stocks to 5-yr averages. Speaking of OPEC, yesterday Ecuador announced that they would cap their production at 541 kbpd, rather than the 522 kbpd the country originally agreed to last November. Ecuador announced last month that they intended to leave the OPEC deal, since the cut production was not generating enough revenue for the country. The fact that Ecuador still feels the need to pay lip service to the agreement is likely a result of the OPEC meeting last week, where members met to discuss falling compliance rates. This comes as deal compliance reportedly fell to 72% last month.